The Army Black Knight's were defeated by Navy 54-48 at the United States Military Academy's Christl Arena in West Point, NY on Saturday, February 20, 2010. 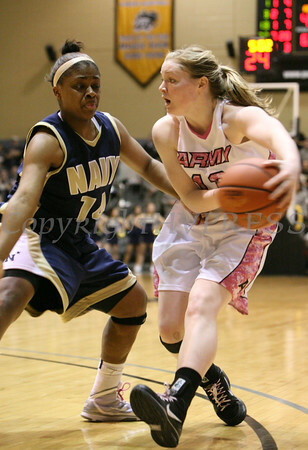 Army Black Knight Molly Yardley (#13) is defended by Navy's Jasmine Pitts (#14) as Navy defeated Army 54-48 at the United States Military Academy's Christl Arena in West Point, NY on Saturday, February 20, 2010. Hudson Valley Press/CHUCK STEWART, JR.